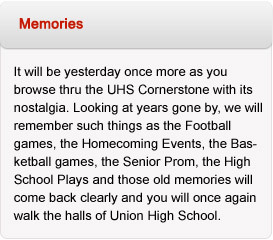 During my school years at Union High School …I have fond memories of our walks to town at lunchtime. We would head to the drugstore’s soda fountain where our lunch money for the day was just the right amount to purchase a delicious ice cream float. Often we stood in line for a while to make our purchase since lots of other kids were there ahead of us and then we would eat our “lunch” while walking back to school, laughing and talking about all those important things in a teenager’s life. My Mom was always a little upset with me when she learned that I had “blown” my lunch money on such foolishness instead of buying a nutritious lunch at the school cafeteria….I never convinced her that those ice cream floats (especially the ones with chocolate ice cream) had just the right amount of calories and sugar to give me the energy I needed for afternoon classes. Anyhow, those walks to town were never about eating, they were about spending time with friends, in fact, I developed a life-long habit….I still love to eat ice cream while walking and talking with good friends.